This is the must-have gift box for anyone looking for the quickest gateway to soft, clean and beautiful skin. The combination of our groundbreaking facial products: the facial cleanser, moisturizer and the highly acclaimed and popular Blackhead Killer guarantees you the skin of your dreams. 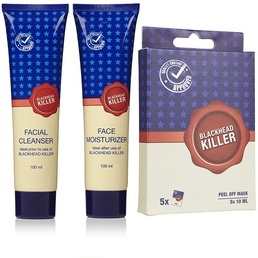 The Blackhead Killer Facial Cleanser is a renewing cleanser for unclogging pores and preventing blackheads. Designed to wash away your pore-clogging impurities, the cleanser prepares your skin for an improved Blackhead Killer treatment. This vitalizing cleanser renews the surface of any skin type – leaving your skin feeling soft and smooth. The Blackhead Killer is a revolutionary and highly acclaimed facial mask that removes blackheads, impurities and excess oil in just a few minutes. By removing the impurities and dead skin cells, the facial mask prevents future breakouts and guarantees you soft and beautiful skin that radiates. The Blackhead Killer Face Moisturizer is the perfect softening moisturizer for skin hydration and closing of pores. Designed to hydrate your skin, treat redness and irritations as well as help prevent any future blackhead outbreaks. A vital component in making your skin feel soft and clean. Lovely product would highly recommend!! !